How our engagement software reports back to you. There are a whole suite of reports available within People Gauge. Each report can be sliced and diced in line with how you operate as an organisation. Integrity checks are built in throughout the system to ensure confidentiality at every stage. All of our reports are visually appealing, easy to understand and easy to communicate. Ensures you capture real time response rates…. just in case you need to gently encourage certain areas of your business to participate. This report is a great way for the HR Manager or your coordinator to keep check on how the responses are coming along and to see whether you need any more effective communications internally. For example it might be that your line managers can get behind it and encourage their teams to participate. We generally find our customers get a great response to their People Gauge surveys. Your staff will find them easy to complete, they know they are secure and it makes them feel valued and listened to. 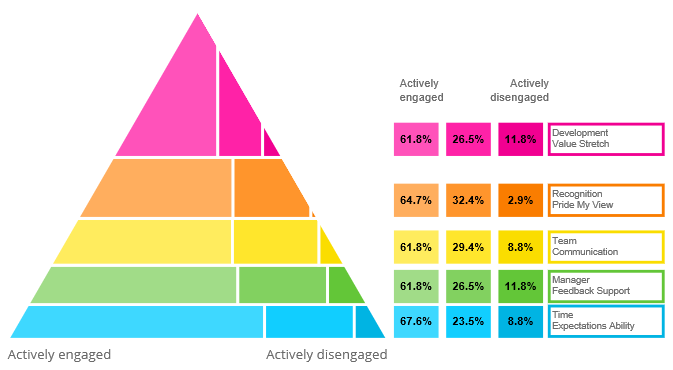 This report shows the overall levels of employee engagement within your organisation, before you start drilling down into different departments and functions. This is a top line report, easy to understand and quite powerful in itself. It’s a great measure as it shows the organisation as a whole. 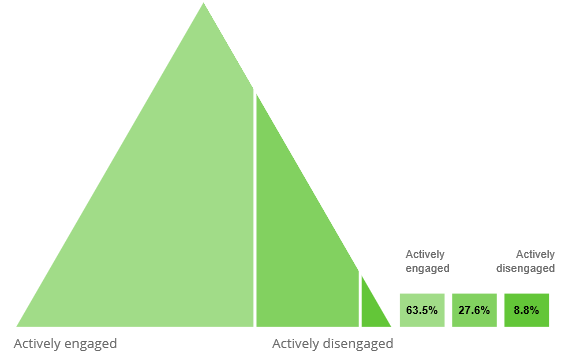 The key to reading this report is looking at the 27.6% shown here – the people in the middle that are neither actively engaged or actively disengaged. What this will show you is that there are people that can be engaged more within your organisation. 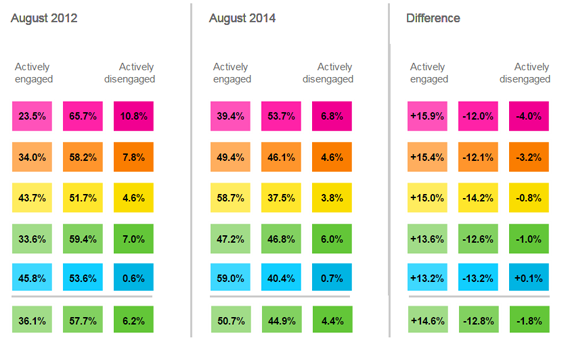 Without seeing it like this, it would be hard for any CEO or HR Director to get their arms around engagement levels! This is the real jewel in the crown of reports. Our Pyramid Engagement Theme report highlights patterns across your business and identifies areas that need the most focus. The individual statement results are gathered into sets which are then mapped against the fundamental principles of Maslow. Again here, you’ll see that there is a middle ground that many are positioned in, and with the right kind of management and culture in place, there’s every chance that you’ll move those people within the middle over to being Actively Engaged. In this example, you’ll see that the blue section – the Physiological section (all about your staff’s expectations, their confidence, ability, etc) they are the most actively engaged. A fantastic base to build up from. As the title suggests, this report shows the raw scores against each of the individual statements. This takes your reporting to the next stage as you’ll be able to see actual statements they responded to and how it effects the engagement levels. The breakdown for this company example shows a really positive level of engagement for the orange section which represents “esteem”. That’s all about their recognition, their view and their pride. There’s only a small amount of people in this organisation that are showing to be actively disengaged, so you’ll know this is an area that should increase by default once you start making improvements internally. Interestingly here, the Self Actualisation section (the pink section) is lower – that’s all about their development, stretching them within their roles, and making them feeling valued. From looking at this, a positive action would be to look at their staff’s personal development plans, profiling their roles and exploring whether there are any chances for growth and development. These are really useful to highlight your progress, year on year, survey on survey, department on department! You can run additional filters on these reports too. This report is great to run especially if you decide to carry out a survey in six and then twelve month – it’ll easily highlight areas that still need attention and recognise areas that have been doing great. What you’re hoping to see here are shifts particularly from those that are in the middle section, moving along to the Actively Engaged section. These show what your people have actually said it’s like to work or engage with you as a business. Not only do the Wordles look vibrant and are a great communications tool to use internally, they will also highlight words and feelings that are more prominent in the thoughts and feelings of your staff. The Wordles add value to the rest of the reports as they provide further insight, without weighing you down with complex reporting. They tap into the inner language of your staff and are pulled together by asking for 3 statement words about what it’s like to work within your organisation. They also act as a great recruitment tool, particularly if you have a positive Wordle to promote, as they can almost give potential employees a snapshot into working within your organisation. If you have elected to ask additional questions then this is where you will find your answers. Most of our customers find that the reports and wordless are enough to go by, but if you’d like to ask more specific questions then here’s your place to do so.